Maximizing the chances of Safe Infant Sleep in the Solitary and Cosleeping (Specifically, Bed-sharing) Contexts, by James J. McKenna, Ph.D. Professor of Biological Anthropology, Director, Mother-Baby Sleep Laboratory, University of Notre Dame. Below I have summarized and highlight some of the issues to be concerned with as you make your own decisions about where and how your infant should sleep. What constitutes a “safe sleep environment” irrespective of where the infant sleeps? Safe infant sleep begins with a healthy gestation, specifically without the fetus being exposed to maternal smoke. Breastfeeding significantly helps to protect infants from death including deaths from SIDS/SUDI and from seconday disease and/or congenital conditions. Post-natally safe infant sleep begins especially with the presence of an informed, breastfeeding, committed mother, or an informed and committed father. Infants should sleep on their backs, on firm surfaces, on clean surfaces, in the absence of smoke, under light (comfortable) blanketing, and their heads should never be covered. The bed should not have any stuffed animals or pillows around the infant and never should an infant be placed to sleep on top of a pillow. Sheepskins or other fluffy material and especially bean bag mattresses should never be used. Water beds can be dangerous, too, and always the mattresses should tightly intersect the bed-frame Infants should never sleep on couches or sofas, with or without adults wherein they can slip down (face first) into the crevice or get wedged against the back of a couch. 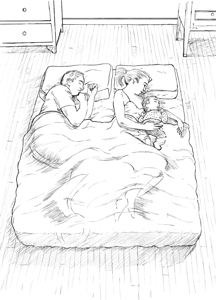 Bed-sharing: It is important to be aware that adult beds were not designed to assure infants safety! Bottle-feeding babies should always sleep alongside the mother on a separate surface rather than in the bed. If bed-sharing, ideally, both parents should agree and feel comfortable with the decision. Each bed-sharer should agree that he or she is equally responsible for the infant and acknowledge that the infant is present. My feeling is that both parents should think of themselves as primary caregivers. Persons on sedatives, medications or drugs, or is intoxicated – -or excessively unable to arouse should not cosleep on the same surface with the infant. Extremely obese persons, who may not feel where exactly or how close their infant is, may wish to have the infant sleep alongside but on a different surface. It is important to realize that the physical and social conditions under which infant-parent cosleeping occur, in all it’s diverse forms, can and will determine the risks or benefits of this behavior. What goes on in bed is what matters. It may be important to consider or reflect on whether you would think that you suffocated your baby if, under the most unlikely scenario, your baby died from SIDS while in your bed. Just as babies can die from SIDS in a risk free solitary sleep environment, it remains possible for a baby to die in a risk-free cosleeping/bed sharing environment. Just make sure, as much as this is possible, that you would not assume that , if the baby died, that either you or your spouse would think that bed-sharing contributed to the death, or that one of your really suffocated (by accident) the infant. It is worth thinking about.